What are the Positions on a Baseball Team? 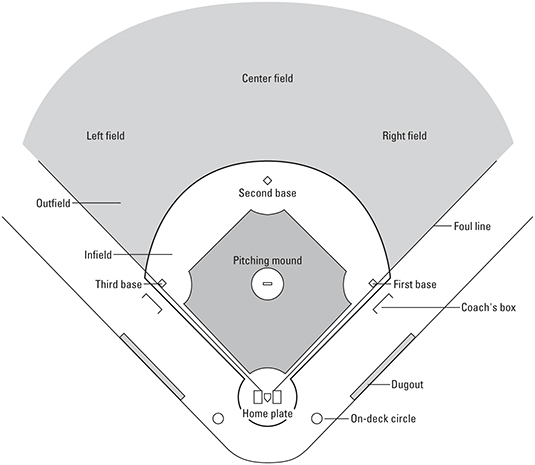 The following figure shows the different positions (and their abbreviations) of the positions on a baseball team. It’s baseball’s chessboard. Knowing the positions and the way they relate to each other can help you understand the role of each as you watch play unfold. You also can see why some positions are more important than others and certain players are more suited for a certain position. After a short while, you can better see that the way a team deploys its players by position can either lift it or sink it. Refer to the following figure to keep track of “Who’s on First?” and the other eight positions (nine, if you count the designated hitter). American League lineups include a designated hitter who bats for the pitcher without taking a defensive position in the field. DH is the abbreviation for that slot.